Senate torture report’s unnamed victims: The CIA had hundreds or thousands of detainees tortured by foreign governments. 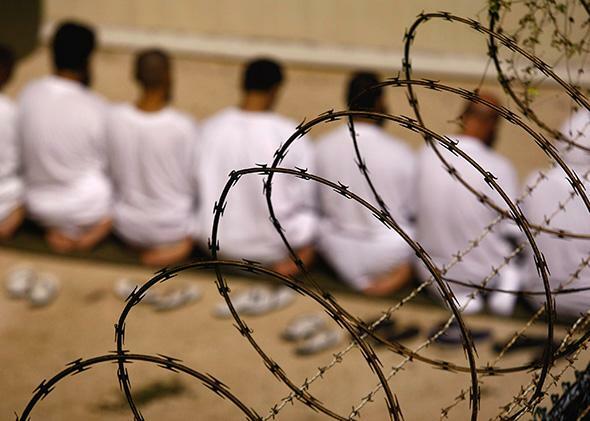 A group of detainees during an early morning Islamic prayer on Oct. 28, 2009 in Guantánamo Bay, Cuba. As bad as the stories in the Senate torture report are, there is a whole class of victims who aren’t even mentioned. The executive summary released last week makes only passing reference to an integral component of the CIA program: the “extraordinary rendition” of prisoners to foreign custody for “interrogation” by those countries’ intelligence services—with the full knowledge that the men would be tortured. Because rendition was beyond the report’s scope, there’s still no official account of the hundreds, perhaps thousands, of other victims of torture that the CIA is responsible for. Much of what we know about this practice of outsourcing torture is from the harrowing accounts of its victims and survivors who have bravely come forward to tell their stories. One of them is Ahmed Agiza, an Egyptian citizen who lived with his wife and young family in Sweden, where they were seeking refugee status. In December 2001, Ahmed and a friend were apprehended by Swedish police, who turned them over to the CIA. In what was reportedly the Bush administration’s first rendition operation, Ahmed and his friend were sent to Egypt, where they were held incommunicado by Egyptian Intelligence Services, interrogated, and mercilessly tortured. In an unfair trial in 2004, Ahmed was convicted and sentenced to 25 years for membership in an organization banned under Egyptian law. The next year, an official Swedish investigation confirmed that the CIA had been involved in the rendition operation, and that the agency had cruelly and inhumanely treated the two men during their capture and transportation to Egypt. The U.N. Committee Against Torture and the U.N. Human Rights Committee also verified the men’s claims of torture and inhumane treatment in Egypt. The Swedish government compensated Ahmed for its role in his torture, and later granted him official residence status. The ACLU filed a federal lawsuit against the American aviation company—Boeing subsidiary Jeppesen Dataplan—that provided logistical support to the CIA aircraft used to render the two men to torture in Egypt. The case was dismissed on the grounds that allowing it to continue would reveal “state secrets.” The United States has yet to acknowledge its involvement in Ahmed’s torture. Another victim is Abou Elkassim Britel, an Italian citizen of Moroccan descent, who was unlawfully rendered by the CIA from Pakistan to Morocco in May 2002. There, he was handed over to Moroccan intelligence agents and taken to the notorious Temara prison, where he was held incommunicado, interrogated, and tortured. He was imprisoned for more than eight months before being released in February 2003 without explanation or charge. Britel was also a plaintiff in the lawsuit against Jeppesen Dataplan, and the U.S. government has yet to own up to its role in his ordeal. A final disturbing story is that of Maher Arar, a Canadian citizen who was born in Syria and left at 17. Transiting through JFK airport on his way home from a family vacation in Tunisia in 2002, he was arrested and held virtually incommunicado for 13 days at a detention facility in Brooklyn. Then early one morning, the CIA secretly flew him in a private jet to Syria, even though he repeatedly told his American captors he would be tortured there. And so he was, brutally, once the CIA delivered him to Syrian intelligence. Maher was held in a coffin-like cell for nearly a year before the Canadian government secured his release home. A two-year-long official inquiry into the Canadian government’s involvement in Maher’s rendition found that he had been tortured, and that Canadian officials—in concert with their U.S. counterparts—were complicit. The Canadian government apologized and compensated Maher for his suffering. Maher brought a federal lawsuit with the Center for Constitutional Rights in an attempt to hold the U.S. government accountable, but Justice Department lawyers successfully argued that his case should be dismissed because it concerned matters of “national security” and “foreign relations.” In 2010, the Supreme Court let the dismissal stand. To this day, the United States will neither confirm nor deny its role in Maher’s rendition and torture, let alone apologize. Because the Senate report covers only prisoners held by the CIA, there is still no official accounting of what happened to these men and others like them, forcibly disappeared and handed over to foreign governments for torture. We don’t even know whether the practice was authorized—and if so, by whom—and who was subject to it. We don’t have details of the inhumane treatment and torture that these individuals faced at the hands of CIA officials, or once in the hands of the CIA’s foreign partners. Just as the victims of CIA torture named in the Senate torture report deserve justice, so do those who aren’t in the report. Investigating and publicly acknowledging their stories would be a good start, followed by criminal prosecutions and compensation where justified.